And to think that people were giving Vancouver aggro this year about their Olympic mascots! 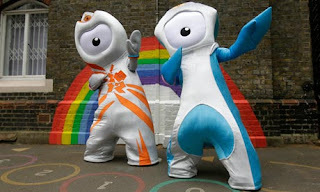 Believe it or not, these weird beings are the official 2012 Olympic mascots for the London-based Games. Meet Mandeville and Wenlock. Yeah, they REALLY sum up Britain, London and the Olympics, don't they? Kid-friendly? Don't think so. They're ugly and not in a good way. Ugly Dolls can rest safe in the knowledge that kids like creatures with some personality - Mandeville & Wenlock have all the warmth and cuteness of a TV tower. Thank goodness there are others who don't like these mascots. I really hate them. At least the mascots for Vancouver had something to do with Canada... These things make it look like the 2012 Olympics will be set in outer space!